Compatible with all iOS devices (iPhone X to iPhone 4, iPad, and iPod touch). How can I recover my iPhone call log? Many of our readers, loyal and satisfied customers, have encountered this problem, and wonder how they can recover their call history from their iPhone. You should not be worried. There are three ways which you can use to recover the iPhone’s call history. All you need to do is to get a professional iPhone recovery software which can help us get the call logs back, and dr.fone - Recover (iOS) is such a tool. Selectively restore what we want from iCloud/iTunes backup to our device or computer. Compatible with latest iOS version. Many users will not have backed up their iPhone at that moment, the moment just before accidently deleting the record of their calls. Many will not have backed up ever. No worries! You can still recover the information from your iPhone directly. Let us walk through the steps to retrieve the deleted calls from the iPhone. In order to recover the call history, you need to connect the iPhone to your computer. You should then run the dr.fone program and, from the opening screen, choose the ‘Recover’ feature and then click 'Recover from iOS Devices’. You should click on the 'Start Scan’ to begin to look for the lost call history. This is where you can choose just what you want to recover. Once the program finishes scanning the iPhone, it will present all the recoverable data which has been found. It will not only be call logs, but also contacts, messages, photos, videos and so on. You now have the option to preview and decide which items you want to recover. Place a tick next to the items you want and click on the 'Recover’ button to save them all to your PC. We do not think it could be clearer. If you do have an iTunes back up to iCloud or to your local computer, either of the following routes should be quicker. 'All or nothing’, that is the choice with iTunes. Any backup from iTunes will contain the records of calls made up until the time of the backup. However, the only choice is to restore everything in the iTunes backup to our iPhone. There is no option of selecting just the individual items you want. The possible problem is that you restore the back up from iTunes it will also overwrite the data which currently exists on the iPhone. You need to think very carefully about any data which was created since the backup was done, and this time now when you are trying to recover call history on iphone. Using dr.fone is going to allow you to selectively extract data from the backup to your iPhone via iTunes. You will not overwrite the data which you do not want to lose. 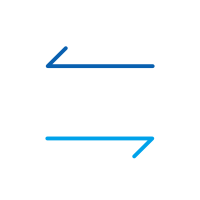 If you have automatic synchronization enabled (it is the default setting), there is no need to even connect the iPhone to the computer with this method. Simply launch the dr.fone - Recover (iOS) program on your computer and choose 'Recover from iTunes Backup Files’. Then you will see all iTunes backups on our computer presented in a list. Simply select the right one to extract, and click on 'Start Scan’. dr.fone will extract the backup in just a few seconds. You are on the road to recover deleted recent calls on iphone. Once completed, all the contents are available for preview. Choose the 'Call History’ menu on the left side. You can read your phone call history one by one. Tick the item you want to keep and save it to your computer by clicking on the 'Recover’ button. You can also restore it to your iPhone by selecting 'Recover to Device’, and dr.fone will not write over any of our original data on the device. Recover just what you want. If you have an iCloud backup then you can try to retrieve the accidentally deleted records from there. However, just as with iTunes, iCloud also does not allow us to preview and select specific data. 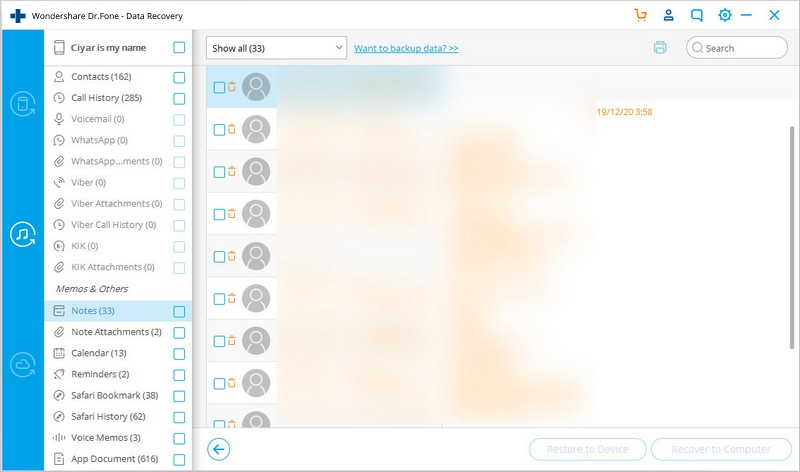 What you need to do is using a third-party tool that can help us extract the backup for selective recovery and restore. There is also such a way to retrieve our deleted calls on iPhone via iCloud backup. 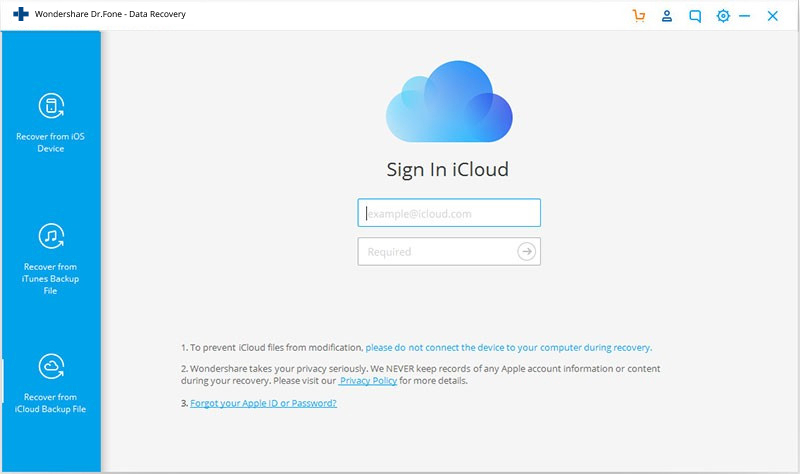 Choosing this way, you need to know your iCloud account, the Apple ID and the password, so that the online iCloud backup can be accessed. 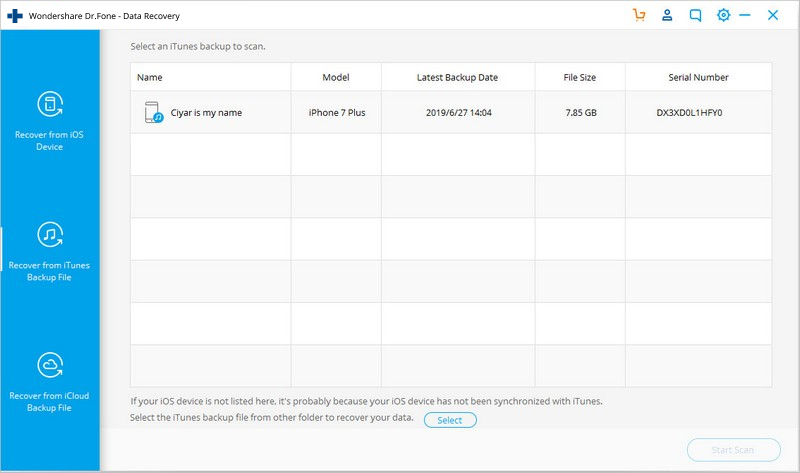 After running dr.fone, switch to the mode of 'Recover from iCloud Backup Files’. Please have your Apple Store account details handy. 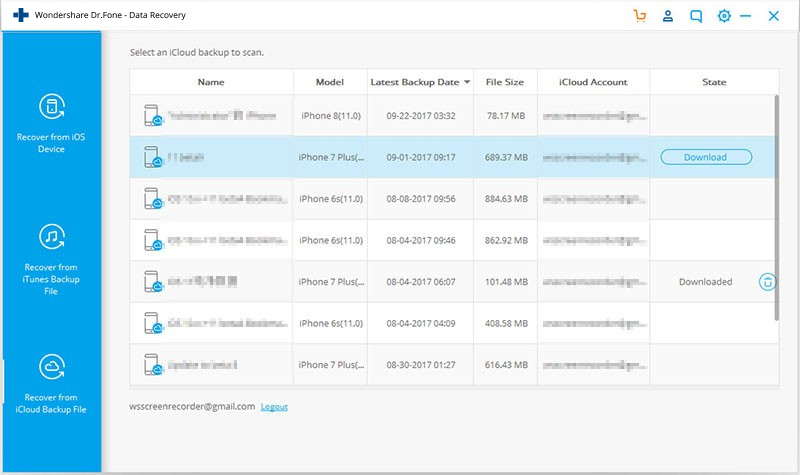 When you have logged in, dr.fone will detect all backup files existing in our iCloud account. Choose the right one, most likely the most recent one, and then click on 'Download’. This process will take only a few minutes to recover call history on iPhone. Please note, you do not need to have any concerns about security, the downloaded file is only stored by you. The most recent file is probably the best choice. After the downloading, click the now available 'Scan’ button to continue. 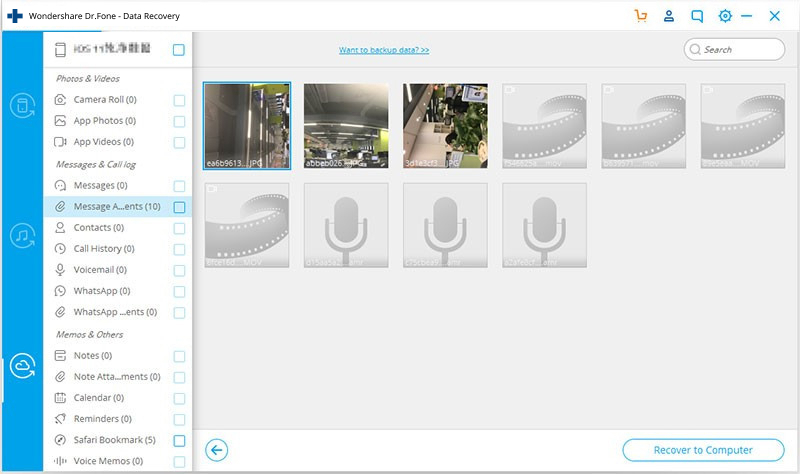 When the scan is complete, you can preview the content of the backup file in detail. If you choose 'Call History’, you can look at, examine and read, all items one by one. Tick the item you want to recover to computer or your iPhone. From the above information about how to recover call history on an iphone, you should now be confident that the situation can be rescued. If you are technically minded, you might be interested to know that the above methods allow the export of the call history in Excel, CSV or HTML file format. Also, if needed, you can click the 'Printer’ icon in the top right corner of the window. We really hope that this has been useful to our readers and our loyal customers. If you have any other suggestions we would be delighted to hear from you. Learn how do I backup my iPhone in this stepwise guide. Three different solutions have been provided to teach how to backup iPhone (iPhone XS Max included) and iPad easily.